CHASE, T.L. 1979. Illustration Techniques for Palaeontolological Exhibits. IN BASSET, M.G. (ed.) 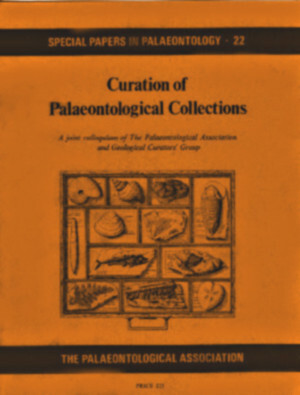 Curration of Palaeontology Collections. Special Papers in Palaeontology, 22, 189-208. Illustrations play a major role in the success of any palaeontological exhibit. To be effective they should be clear and simple, as well as aesthetically pleasing and durable. Techniques for preparing murals, diorama backgrounds, easel paintings, photographs, and drawings are discussed, with special emphasis on their use in palaeontological exhibits. Means for protecting illustrations from photodegradation, proper techniques for mounting illustrations for exhibition, and a procedure for printing illustrations directly on exhibit panels by means of silk screening are also described.